The Europa 2014 ‘National Musical Instruments’ issue features the Royal Gibraltar Regiment Band and Corps of Drums. 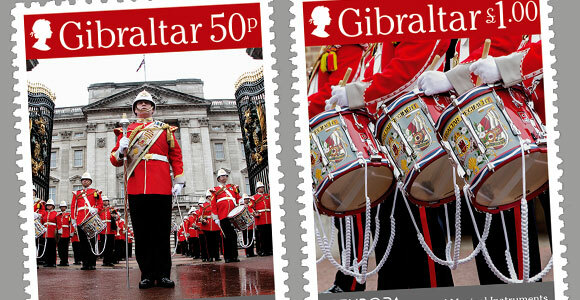 The stamps depict the Band and Corps on Buckingham Palace duties. It was only the second time that the regiment had performed public duties in London. The Royal Gibraltar Regiment took over from the Coldstream Guards at the famous Changing of the Guard ceremony at Buckingham Palace. Fifty children from St Anne’s Middle School in Gibraltar were amongst the huge crowd that gathered to watch the ceremony as the Royal Gibraltar Regiment Band and Corps of Drums led the regiment’s detachment out of Wellington Barracks, in through the huge gates of Buckingham Palace and onto the centre of the Palace forecourt where they were met by the cheers of the Gibraltar schoolchildren. Their scarlet tunics were a perfect match for those of the waiting Guardsmen but their white Kitchener helmets were in sharp contrast to the black bearskins of the Old Guard. In the group of VIPs watching from the edge of the forecourt was the then Governor of Gibraltar, Vice Admiral Sir Adrian Johns, and former Governors Field Marshal Sir John Chapple and Lord Luce. The Corps have developed considerably over the years into an ensemble that not only serves its own regiment, but British Forces Gibraltar and the local community. The Band and Corps work closely together and perform as a combined unit for ceremonies such as HM The Queen’s Birthday parade, making the most of opportinuties for bagpipe, fife and bugle music. They travel extensively including trips to UK, Northern island and Morocco. The musicians, with the exception of the Bandmaster are from the local community and form part of the Territorial Army contingent in Gibraltar.